Once registered for a online exam, a user is provided a login id and password.The test result of the candidates, which comprise information such as, name, login id, course name, and marks and thereafter displayed on the website. Tables can be used to display such information, which are arrange in the forms of horizontal rows and vertical columns. 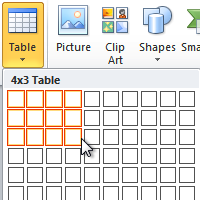 The<Table>tag act as a container for tags that are used for creating rows and columns and adding data.The table contains a opening<Table>tag and closing</Table> tag.In addition, you can also control the appearance of the border around the table.This is done by the using border attribute of the <Table>tag. 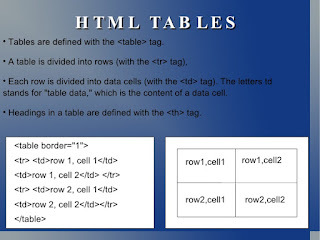 The Table Body contains data arranged in rows.Each rows further comprises one or multiple columns.The rows of the body of the table can be grouped by using<TBody>tag. You can use more than one<TBody>tag inside the <Table>tag. This is done when you want to logically groups the rows of the table body for applying different presentation styles to each group. 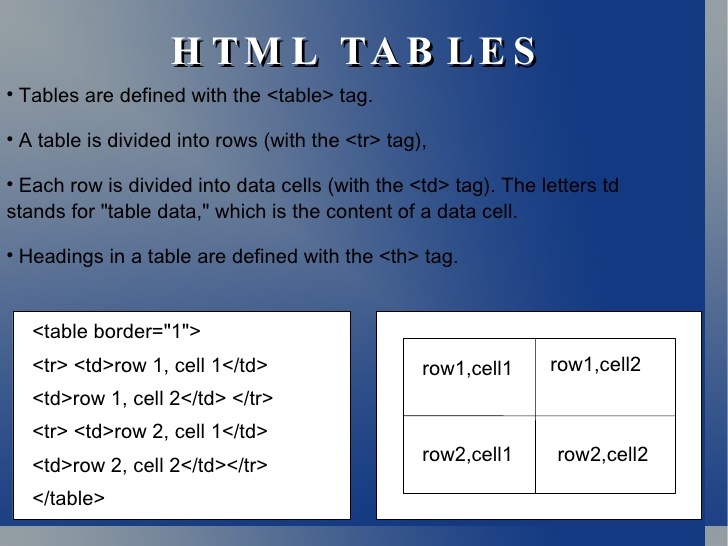 For adding rows to the table <TR>tag is used.The contents of the rows are placed between the <TR> and </TR> container tags.The content of each rows comprises one or more column values.The number of rows in the table depends on the number of <TR>tags within the <Table>tag. For adding columns to the rows <TD>tag is used.The <TD>tag specifies the content of the columns.The content is enclosed within the <TD>and </TD>container tags.The <TD>tag is ised within the <TR>and </TR>tags. The table header is the row that contains the headings for the columns of the table.The headings in the table provides a brief explanation about the data in a subsequent rows of the table. To create the Heading for the Table Columns , you can use the <TH>tag.The <TH>tag display the heading in bold and is centrally aligned. Consider a situation where you need to provide a summary for a table rows. Foe Example- at the end of the table, you need to specify the total number of students.For this, you can use the <TFOOT>tag, which is always specified after the <THEAD>tag but before the <TBODY>tag.The <TFOOT> tag contain atleast one<TR>tag. After creating a table you should define a title for it . A caption Specifies a title for a table. It enables a users to understand the informations that the table displays. Consider the following code snippet that shows the use of the <Caption> tag in HTML.